I was absolutely thrilled with this month’s Arcade Block. It was like opening a small portal to the ’90s—my childhood. Unlike other monthly box subscriptions that I’ve had before, I actually loved every single item that came in the box (the box itself is also really cool). This notebook is colorful and just the right size, I can take it in my purse or throw it in my backpack and take it to school. There are 120 pages and seven different colored sections to help keep your notes organized—something I always need help with. The edge of the pages are all shaped like Tetris pieces which give the notebook tabs, like the kind you would find in a binder to organize different sections. Overall, the entire notebook just has a really cool look as well as being very functional. I hope that the Official Tetris product website eventually expands this notebook into an array of office and school products like notebooks and sticky notes. This little notebook is a great way to keep yourself organized as show off your inner geek in a very subtle way. The Tetris Notebook will cost you $7.99 on Amazon. This product really surprised me, I never thought I would ever see merchandise with old school characters like Earthworm Jim or the Battletoads. It reminded me of warping through space as Earthworm Jim on his rocket, avoiding comets and space junk. There are four pins total each with an iconic Sega character on them. Sonic the Hedgehog, Ryu (Ninja Gaiden), Rash (Battletoads) and Earthworm Jim were all reproduced in their classic art style. Who doesn’t love pins? I personally have all of my backpacks and messenger bags decorated in tons of them, these Sega pins are going to be an excellent addition to my collection. I have yet to come across any Sega themed pins (or even merchandise) until Arcade Block, and I am absolutely stoked. This pin pack would probably cost around $4.99 or $9.99 on its own. I don’t care how old I get, I will always love stickers as much as I did when I was a kid. 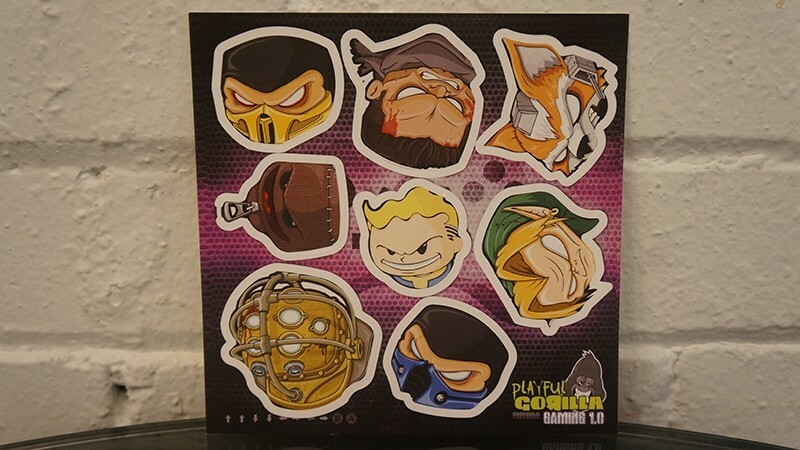 The Gorilla Stickers feature old and new school characters alike—Scorpion, Starfox, Sackboy, Link, Vault Boy, Mr. Bubbles and a couple other videogame characters. What makes these Gorilla stickers are the style they’re done in—each character looks mean and prepared for battle. Even the normally cute and cuddly Sackboy looks like he could take you outside for a proper beat-down. You could decorate your new Tetris Notebook, your boring cubicle at work, or even your cat with these Gorilla stickers and they are guaranteed to add +10 awesomeness to whatever they adorn. These stickers run between $10-12 retail. Included in the Arcade Block was a little Halo Ghost model for you to build yourself. It came with a Spartan Recruit figure and a Covenant Elite figure, complete with weapons. The building instructions can be a little hard to follow at times, since all of the pieces are basically the same color, but the entire building process took me about 20 minutes (I wouldn’t recommend dumping the pieces out on your bed). The Ghost is complete with thrusters and even little foot pedals for your figurine to rest comfortably on. Building Megablox models are always entertaining, and it’s a great break from a stressful day. I enjoyed building the Ghost and posing my Spartan Recruit and Covenant Elite figures for battle. Even if you aren’t really into the Halo videogames series, this is still a fun toy to get. This box of Megablox costs $13.99 on its own, so receiving it in a bundle of items for $19.99 is a really great deal. If you didn’t play the Plants vs. Zombies videogame, then this comic book probably won’t make much sense to you, but I assume that most people know the general idea of the game. This comic book is a funny spinoff story from the original Plants vs. Zombies game, and the book itself is of excellent quality, printed on thick glossy paper in full color cover to cover. The story is about an evil zombie scientist who is trying to vacuum up all of the sun with a machine he created—if the sun is vacuumed up, then the plants cannot grow and the zombies can finally win. The sun-vacuuming machine blows up and the pieces are scattered throughout space and time, sending all of the zombies searching for them. The humans find out about the machine parts and try to beat the zombies in finding them. It’s a cute story, but I feel like it is more appropriate for kids. The book is longer than your average comic book, so expect a good 25 minute read from it. It’s a fun little extra included in the box that I enjoyed reading, but as I said before, you would probably have a hard time understanding the story unless you’ve played the game itself. I really love the design on this T-shirt and can definitely see myself wearing it on a regular basis. However, keep in mind that if you plan on subscribing to Arcade Block, their T-shirts are only men’s fit, not women’s fit. So when I tried on my shirt (size medium) it was noticeably too big for me, which was a little bit disappointing. The quality of the shirt is nice, and I’m sure if I had gotten the right size that the fit would be comfortable as well. I hope that Arcade Block offers women’s fit shirts in the future, but for the price, I am more than happy with the men’s fit shirt. I’ll still wear this shirt regardless of the size because the art paired with the pun is just wonderful. I’m sure that this shirt would sell for around $19.99 on its own, so getting it in the box with all the other goodies was a great score. Overall, I really enjoyed this Arcade Block. I have already used all of the items in it and loved the nostalgic feels that it provoked. I’m already excited to see what comes in the February subscription of the Arcade Block. For $19.99, this is definitely something that is worth subscribing to if you are a videogame geek like me. It’s like opening a present every month that is filled with items you would have a hard time finding anywhere else. I would strongly recommend the Arcade Block over other monthly box subscriptions.